A comprehensive yet accessible resource on this time period, Encyclopedia of the Enlightenment, Revised Edition is a valuable and unique tool for students and the general public. Substantially expanded and thoroughly updated, this revised edition includes recent scholarship, a greater geographical area, and a more diverse group of historical figures. 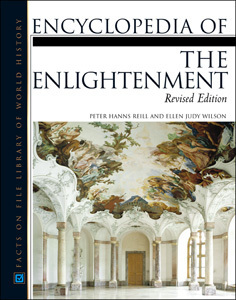 Building on the foundation of the successful previous edition, Encyclopedia of the Enlightenment, Revised Edition addresses a core subject of the school curriculum. With broad cultural and geographical coverage, this valuable and authoritative reference features articles on general topics such as science, education, art and architecture, aesthetics, and music; personalities; countries; notable works; and concepts. For the revised edition, many of the core entries have been expanded, and all articles have been revised and updated. The encyclopedia includes approximately 830 entries, further reading lists with all major articles, as well as more than 100 illustrations. "...wealth of information...a worthwhile investment for a basic reference collection." "...a worthwhile and reasonably priced purchase for public and academic libraries of all sizes." "...a very good reference book on issues and topics related to the Enlightenment."